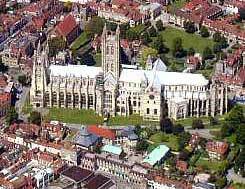 The web site that you have just entered is a portal for the beautiful city of Canterbury. The site is aimed at locals and visitors, providing an up-to-date resource of contacts in the city and the surrounding areas. We have the most up-to-date events listings in the area, and a thriving Classified section, click on the menu on the left to explore these sections. It's free to submit your event, place an advert or update your own contact details. Each entry in Around Canterbury gives you contact details for the organisation or company. Where we have email addresses for the contact, you can use the site to send a message. Messages are sent using a contact form, to prevent bulk emailers from collecting email addresses from the site. If your company or organisation is here, (use the search button to look for it), then please check that the details we have for you are correct. If not, please request an update using the appropriate button and our staff will correct the information. If you are not here, then please find an appropriate section and use the Add an Entry button. There are various types of enhanced entry and advertising options too, check out the About Us section. About Canterbury holds more than contact lists. We have an up-to-date event listing system, where you can add your own events; we have a hotel booking form for visitors to Canterbury; we have a free small ads section where you can post your own ad.